For some of you, finding fusible knit interfacing may be a challenge, I certainly thought it would be here in New Zealand. Surprisingly enough though, I did end up finding 2 different kinds in Spotlight. The first one cost approximately 1 million dollars, came in a neat little box and had enough for a postage stamp (okay, I might be exaggerating there, but for the price, there may as well have only been a postage stamp amount in there. You don't need a lot for Juniper, but still, that price tag, yikes!). The other one, the kind I ended up buying, was living deep down in the interfacing-bin-of-doom amongst all the other interfacing. If you've ever been to the bins of doom at Spotty, you'll know what I'm talking about. However... if you know you're not going to be able to find any, you don't technically need your interfacing to be a knit interfacing. Most of the neckband on Juniper is eased into the cardigan, except the button section, which is where you put the interfacing. So, you don't need any of the stretch in the knit to fit that section into your bodice. 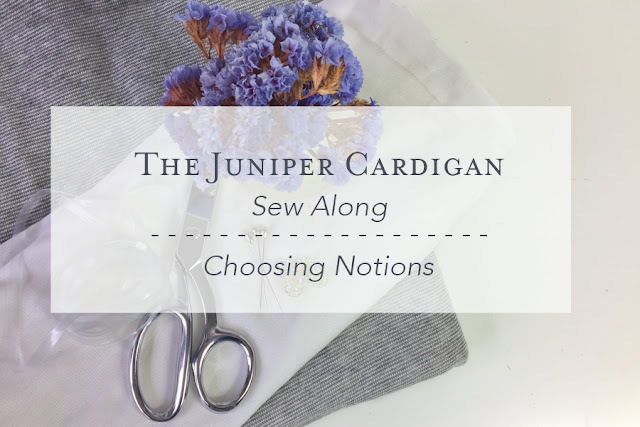 It matches exactly to that part of the cardigan, meaning you don't necessarily need the give that you get with a knit interfacing to make the cardigan fit together. You can use a lightweight woven interfacing here. So, why did you tell us we needed knit interfacing then? Well, it's good practice to use it if you have it - knit interfacing is designed for knits after all, so if you have access to it, I would recommend using it. It does leave your knit fabric with a little more give around the button band area, helping it to lay flat and hang/sit slightly better, while giving the button section more stability. Well, let's go back to that knit interfacing I did find (not the 1 million dollar one). It was thicker than I would have liked and while I used it perfectly fine on the navy/mustard version of the cardigan - the sample that used the fabric weight that I drafted the pattern in - the cropped versions? Both of those were made using heavier fabric, 250gsm, and when I trialled the knit interfacing, it was too much for the button band and it ended up making it bubble in a not-so-nice way. So I used plain, light weight woven interfacing for both of those and they turned out beautifully. Also, it's a good reminder to test your interfacing on your fabric first. The number of buttons on the supplies list is really only a suggestion - you can use as many or as few as you like. In fact, if you've been paying attention, you may have noticed that the blue patterned cropped version actually only has 5 buttons on it! The buttons I used were vintage glass buttons. I took them off their card to take a pretty instagram photo (of course) and then promptly lost one. So, five buttons it was. Some of my testers used more buttons, some less, but at the end of the day, it's completely up to you what you choose to do. The only thing I would recommend is not going above 1.5cm diameter, otherwise your buttons may look out of proportion to the button band. To keep your shoulders where they should be over the lifetime of your cardigan, as opposed to slowly drooping out of shape, adding in some clear elastic to the shoulder line is a good idea. You could also add twill tape or ribbon if that's what you have to hand, but be careful of the weight you choose as you could make the seams bulky, and since the shoulder area is where the detail of the pattern is, you may wish to avoid this. You can purchase your Juniper Cardigan pattern here.